Elucidation means 'to make something clear'. Deep below the Vatnajökull glacier in south west Iceland, I explored the Crsytal Ice Cave as my guide waited near the entrance. Walking through the ice cave by myself, it was hard to capture the shot that could show everything I was seeing and feeling. The power of the ice and water, the beauty of the walls and ledges, and the stunning deep blue color that poured through the walls cannot be described in words. As I began my trip back towards the front of the cave I had my shot. Stretched across the cave about 10 feet above my head was the most beautiful natural bridge sculpted purely from the glacier ice. 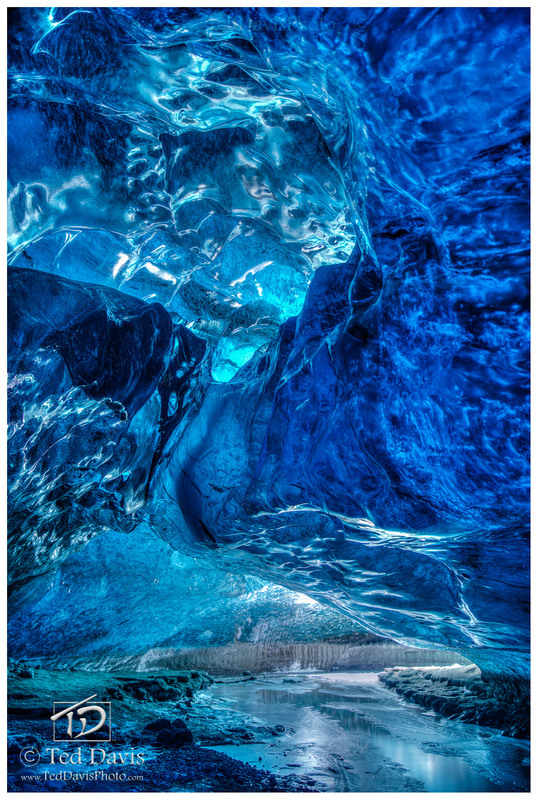 With the glow of the sun streaming through a hole in the Crystal Cave roof, the color of the ice flowed from a deep ocean blue to the lightest blue the sky can make on those clear mornings in the country. "Elucidation" made clear to me the beauty of the Crystal Cave, and I hope it can for you too. To read about my capture of the shot, the full story is here on my blog.. Photo © copyright by Ted Davis.